We hope you can join us for this informal viewing! Today is our optional check-in deadline! To check in, e-mail us at southparkbigbang@gmail.com. If everything’s going well and you’re content to keep going at this time, no worries! We’ll see you on March 1, 2013 for our mandatory check in. 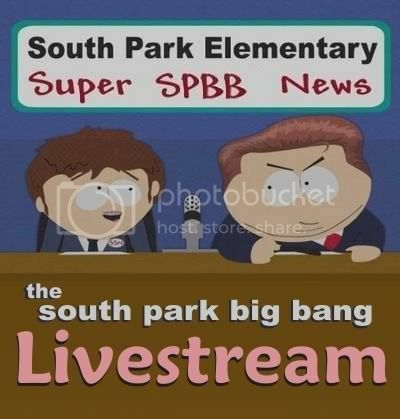 Hey guys, we are planning an informal livestream of a few episodes of South Park and you're invited to join us! Of the following dates/times, which would you prefer? We're supposed to talk here, right? Let's talk. I've been feeling pretty behind on working on my big bang fic. I have about 5k of my draft written, which I wrote like, shortly after I signed up, and I haven't touched since. I'm anticipating being way over the 20k minimum this year, so I was already feeling a little behind. I only had a partial outline, and a vague idea of where I was going. Well, the internet went out for an hour or so today, which sucked, but it gave me some distraction-free time to get my outline finished up. It looks like it's going to have a prologue and four parts, though I'm not sure if these parts are going to be actual chapters, or if I'm just going to blend them together somehow. This actually kind of intimidated me, seeing it all laid out and where I want to go with it, because I'm kind of getting the feeling that I've bitten off more than I can chew, in terms of content. But I'm desperate to try to write a more complicated fic for once, rather than having Stan and Kyle as like, the only characters. So basically, this is largely experimental, and I'm very worried it's going to blow up in my face. So, I want to know: what kind of progress have you guys made? How are you feeling about your ideas? Am I the only one starting to feel a little overwhelmed? Good luck to everyone, we are excited to see what you create this year! Just click through to go to the sign up post right now! Hope to see you there! SPBB Beta Sign Ups are open NOW and will remain open throughout the challenge! 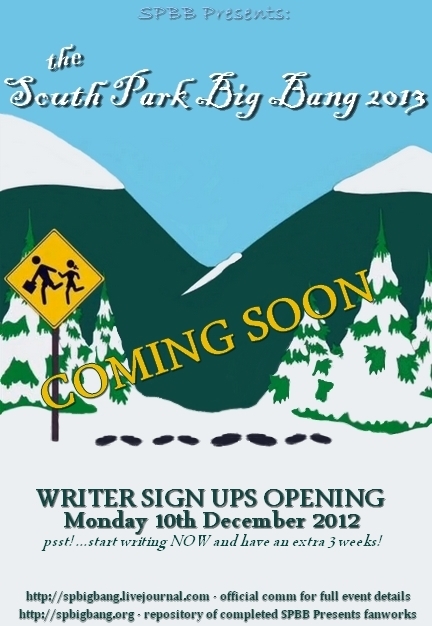 Sign up if you'd like to offer your services to Writers in the South Park Big Bang 2013. 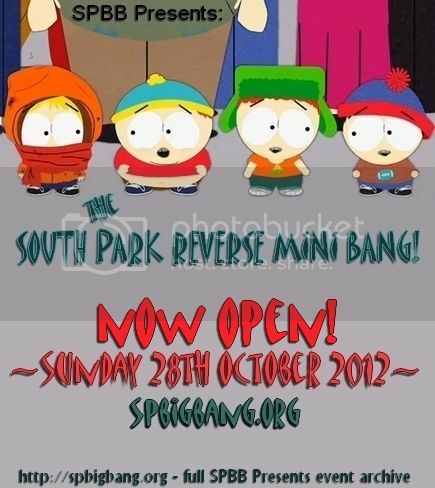 Click through the pic - for more information, and to go to the sign up post! 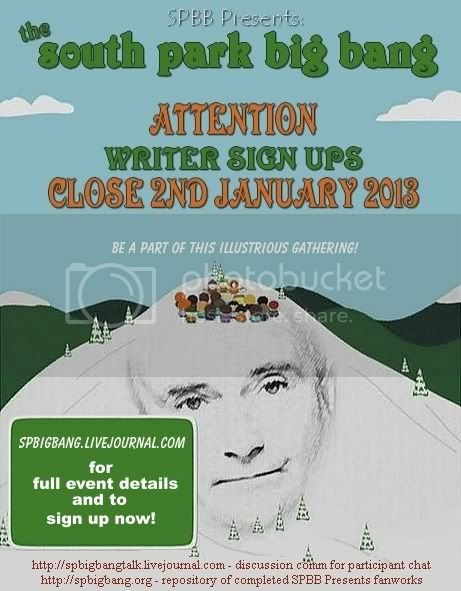 Writers - your sign ups open tomorrow 10th December, but it's never too early to start thinking about your fic! - here is our burgeoning Beta Reader resource. Track this journal so you can check out each new Beta as they sign up! 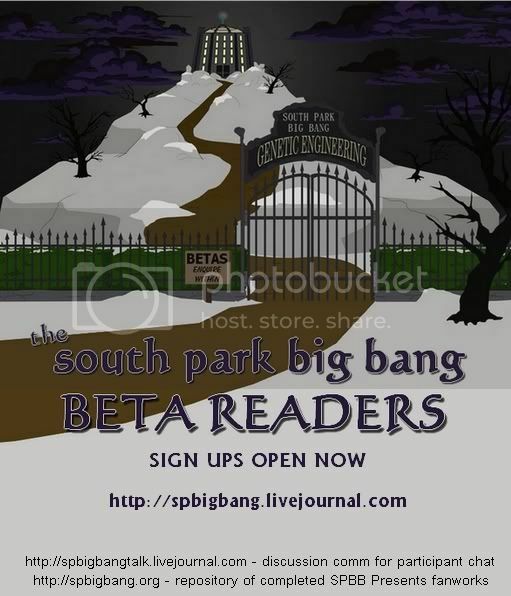 Writers - you can start your SPBB 2013 fics right now, no need to wait for the sign ups to open! Artists - watch this space! We'll open your sign ups in 2013 to get you matched up with the perfect story! For updates, track this community, or follow our twitter or tumblr.